Tonight Phuc and Huyen invited the whole gang to Quang Da`, a Vietnamese restaurant specializing in the food of the Central region of Vietnam. After dinner we are getting together at our house for Coffee, Tea and Pastries. 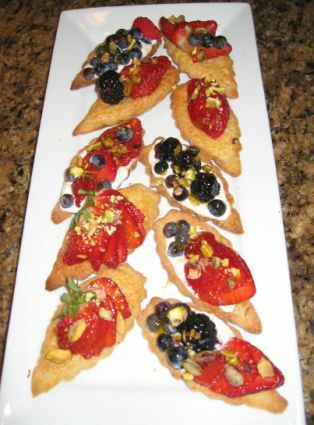 For tonight I made the miniature fruits tarts with two kind of fillings. 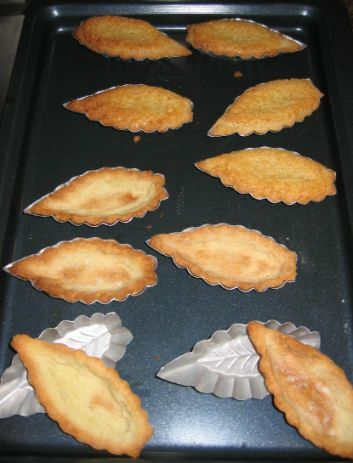 The first filling is with Almond cream (Frangipane) and the second one is made with whipped cream and Mascarpone cheese. I tasted the one with the Almond filling and it was very yummy! I always like this tart! 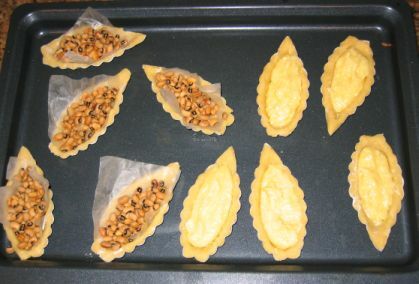 The dough is crunchy, the filling is very tasty and not too sweet, and the addition of the fruits on top is a perfect combination. For the dough, I picked the Pâte Sucrée and made it from scratch. 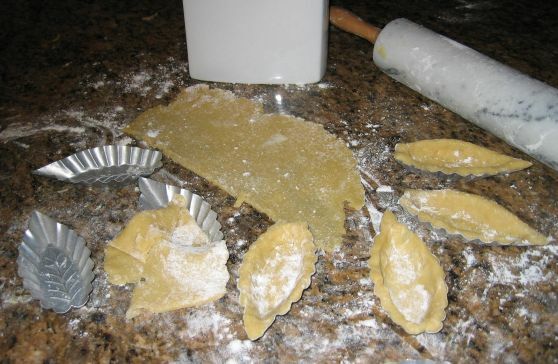 It is actually very easy to make if you have a food processor. Here, I rolled out the dough and then fit it into a small mold! It does take a lot of time but the end result is so delicious that it is really worth the time. On the left of the tray I used beans as weight so that the dough does not shrink while baking. 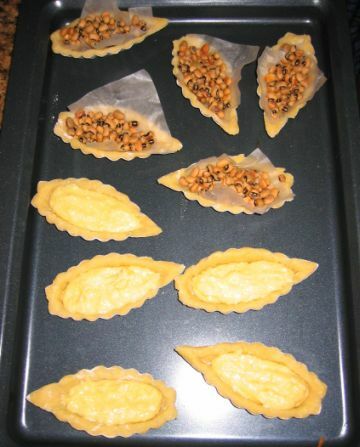 On the right no weight is needed because the almond filling cream act as weigh and therefore the dough will not shrink. 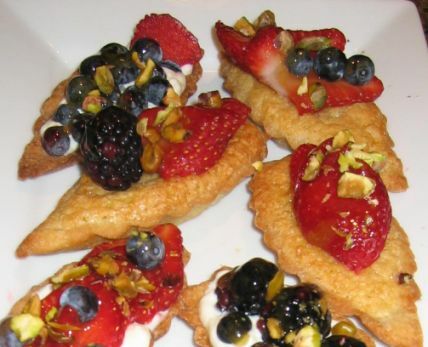 I remove the weight and will fill it with whipped cream and mascarpone cheese for the bottom five tarts. The other five already have Almond filling so all I need to do is decorate them with a variety of fruits. Beside the fruits tarts I also made a Gateau Basque and a Tarte Tatin.